Kakavia is not a fisherman’s only privilege, it is very popular with households too. The soup requires more than one type of fish, and there are two ways to go. You can either use a large, meaty deep water fish of the grouper family or smaller, thorny fish that go on the market for a very low price. There is no set type of fish to use, just what is in hand or more precisely at the fishmongers. Using brackish water to cook the soup. This is not a good idea! Even at sea, just a small amount of sea water is used to salt the soup, go for the safe option of salt. Cut the potato and onion in four and your carrots in large pieces. Add in the pot with a litre of water the carrots, potato, onion, celery. Boil until the vegetables are soft, approximately 20-25 minutes. They should cook within 10 minutes. 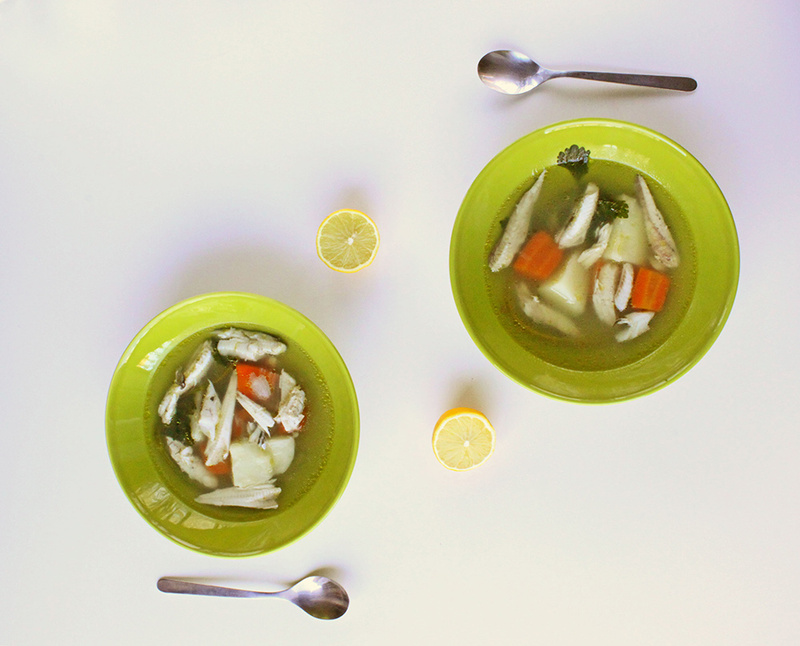 Serve vegetables and fish in the broth with a bit of lemon. This is a very basic soup and of course you can add any fish or sea-food you like. Do you have a favourite fish or sea-food for your soup? Let me know in the comments. Lovely to hear about your markets. I am more excited about deep sea fishing though! what a wonderful thing, I hope I will be able to get out there myself at some point. Those fish are almost to too cute to eat–almost. Looks good and low in fat!